If you have a lot of jewelry, or other small accessories this hanging organizer may be exactly what you need. It takes so much less room to see all of your jewelry than with traditional jewelry boxes. Plus, you can keep earrings together so you don't misplace one of the pair, and have to hunt around when you want to wear them to find the match. Basically, this is a vinyl organizer which you hang in your closet, and takes as much room as a coat. It holds loads and loads of light and little objects separately. It is very handy because it is double sided and has a total of 80 compartments, with some at the bottom being bigger than the smaller pockets at the top. Typically, you should put smaller jewelry, such as earrings and small necklaces at the top, and then larger chunkier bracelets and necklaces at the bottom. An especially great feature is that you can easily find the objects you are looking for because the pockets are all clear, so everything is visible. Like I said above this is great for jewelry, but for all kinds of other things too. In fact, it is one of my all time favorite home storage solutions for small, light objects. 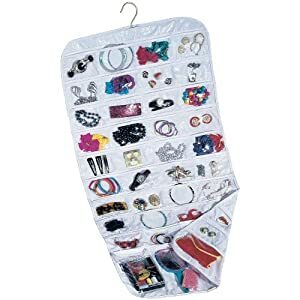 Additional examples of things you can store in this hanging jewelry organizer include hair accessories, such as barrettes, ribbons, and clips, makeup, toys such as Polly pockets, Barbie clothes, and Matchbox and Hot Wheel cars. In addition, you can hold craft items, like light beads (if you use heavy beads check out the craft organizer products). I'm sure there are even more ingenious uses for this product, and if you've used it and have some additional ideas to share please do so in the comments. Please note that this hanging organizer is not designed for travel, but instead to designed to hold your entire jewelry collection for everyday use.